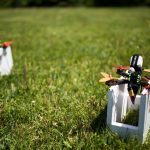 Readers of this site are probably familiar with drone racing world championships and national competitions. Only a few incredibly skilled pilots are able to compete. Fortunately, you don’t have have to be a top-tier pilot to enjoy competitive FPV racing. Our own local communities can provide everyone with access to this exciting sport—and racing as part of a local community is some of the most fun you can have with the hobby. In part 1, we explored the foundations and frameworks for organizing your event including location, regulations, classes, and registration. You’ll want to take a look if you missed it, because this article builds a lot on what was outlined there. Here in part 2, we’re going to explore the nuts and bolts of running a successful race day. Make sure you’ve told everyone where to park and where they can find check-in ahead of time. You’ll also need to decide where your pilot seating and pit area will be. Placing some of these near the start/finish line typically makes sense. It’s worth noting that this position may not be ideal in terms of avoiding radio interference—when one racer is flying very close their signal can overpower others that are further away. Keeping the number of racers at a time to about 4, using generous frequency spacing, and limiting the video transmitter power is usually enough to mitigate this issue. If you’re going to attempt to have a lot of quads in the air at once, though, you’ll probably need to adjust with this in mind. Each time you set up an event, you’ll need a race course. A few organizing bodies offer standardized course layouts, like those offered by MultiGP. The idea is that you can compare your times with pilots and clubs all over the world that use the same specs and the same courses. It’s not perfect because weather, humidity, and altitude mean you’re not really competing on perfectly even footing. These layouts don’t use the natural environment and require flat spaces with specific measurements. We prefer to set something up that’s more interesting and unique. You’ll probably want some materials to mark out your courses. Some investment may be needed here. There are a lot of options at different price points. Field cones are a popular option as they are brightly colored, easy to lay out, and resistant to wind. Feather flags are also popular because of their high visibility and ease with which they can mark out turns. Our group often color codes our flags to which side you should pass on, similar to ski slalom flags. Do some research and ask around to see what people might have on hand. If you can, find a sponsor: a business may spot you some flags if their name can go on it. Don’t forget to integrate the location into your courses; trees make great obstacles and corner markers for free. The best courses challenge pilots technically in some areas, and allow them an opportunity for speed in others. Creating a speed section is easy: use long straights and gentle corners. Often, the gentle corners are more fun than the straights! For your technical sections, you have many choices: tight turns, switchbacks, hairpins, and roundabouts, for example. You can use a few of these features right after another, but don’t cluster all of them together—pilots will appreciate time to breathe and orient themselves before the next section. Avoid having the course cross through or near to itself so there’s little risk of a collision from pilots flying different directions. Race gates are another common and popular feature. Gates can be difficult and intimidating for less experienced pilots, so to be inclusive we make them optional. Pilots who choose to fly through them get a time bonus. When integrating gates into a layout, it’s very important to pay attention to how much time pilots have to set up for them. Making the approach short or at an angle increases the course difficulty a lot more than it might seem like it should. Don’t forget about the 3rd dimension! 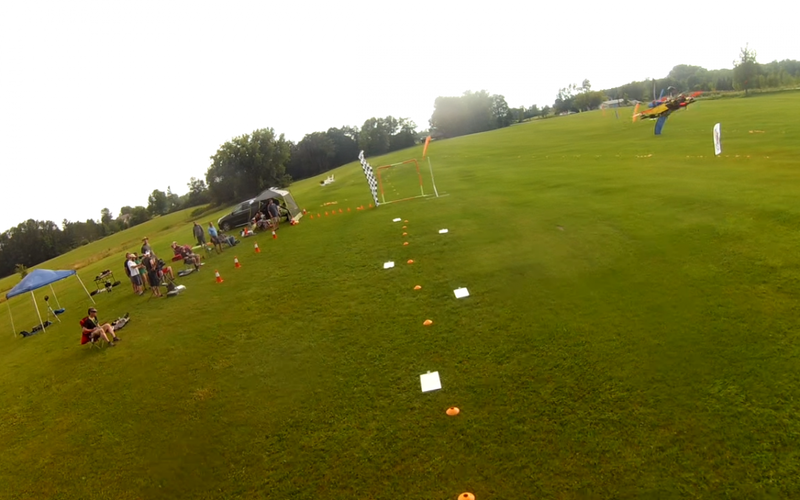 Flags and field cones set up easily on a 2-dimensional surface, but a great drone course also makes use of height variation. You can specify the course goes over trees or through elevated obstacles. Just placing subsequent turns at the top and bottom of a steep hill adds interest to your course. Safety is an important aspect of course design, too. You will have already decided where your pilot area is, your pit area is, the parking lot, and other potential hazards. Never have your speed sections heading toward these hazards! When you create the course, think about the direction of momentum: where would a quad end up if it crashed at any point? A quad that’s lost control will almost always head toward the outside of a corner, so there should always be a buffer zone there. We’ve also found that a generous approach before the start line helps considerably. Pay attention to video signal strength as well. If you go behind hills or trees, you may have pilots losing signal. Developing the layout should be done ahead of time. Use a satellite map to view the location and plot out where the hazards will be. Google Maps’ custom map feature allows you to draw right on the location and share with others. Scout the location in person if you can, because it’s often hard to get a sense of scale from these tools. Print out and arrive with a course map. Course setup can be greatly sped up if you give copies of the map to people to set up different parts of the course at once. Afterward, these maps are a useful reference as racers arrive for quickly learning the line. Many types of racing rely on knowing lap times and total race times. Having race times is the most fair way to determine standings. Each pilot knows where they stand against the others and it doesn’t matter who else was on the course with you when you raced. It’s difficult to argue with the clock. There are a few different systems available that can be purchased and set up to collect this information for your races. Right now these are either based on installing an infrared transmitter on each quad or analyzing video transmission signals in use, but more and cheaper systems are being developed. Timing can also be done by hand with a stopwatch (which most people carry around for free on their phones) but takes extra manpower and careful attention to detail to get accurate results. One feature we make use of with our timing system is the “staggered” start. The way it works is that your race time begins when you cross the start line for the first time. You can choose to punch off the block immediately or wait a few seconds before lifting off without a penalty. 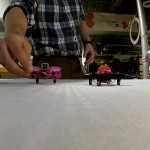 Some pilots may miss the frenzy of a traditional rush start, but this method has reduced the number of race-start collisions significantly while still providing fair timing and close proximity racing. Because this is a community race and we’re largely here for fun, this seems like the right choice for us. Without any timing system, you can do scoring with a point system based on heat finishing order, or run elimination-style brackets until a winner is determined. These methods can generally determine the “best” racer in the group, but are often poor at showing the rest of the group how they stand against each other. The fastest racer might eliminate the 2nd fastest in the first round. This is fine for informal gatherings or winner-take-all tournaments, but it’s less useful for helping pilots improve and setting up races with equally skilled pilots later on. Setting up heats gives everyone a rough personal schedule for the event and ensures everyone gets equal opportunity to race. To set these up, you need to know who is coming—which you already have if you’ve done a registration. It’s generally fine to start by randomizing placement, which gives everyone a chance to race with different people each time. We always place each racer into two heats. The best time counts in the standings. This way a crash, mechanical problem, or unintended collision doesn’t mean you’re out for good. From there, we adjust the heats to avoid having any pilot fly two races in a row. This allows time to make a repair, get a new battery, or whatever else is needed before being thrown into another race. Finally, it’s really important that you know the racers you assign can use the course at the same time. This is where frequency management comes in. It’s best to avoid areas with any standing water. Someone will inevitably end up in even the smallest of puddles. It’s hard to overstate the importance of good video frequency management at a race. This can make or break your event. It’s a big challenge because racers have to share a pretty limited amount of spectrum, and it’s not always obvious how the different bands and channels interact with each other. There are many different methods to do this, so research what various groups do and find a system that works. All good management strategies start with the pilots. Compliance with whatever strategy you use is absolutely necessary, because just plugging in a battery at the wrong time can knock someone out of a race. One of our most important regulations is this: nobody powers on if there’s a pilot in the air. It’s non-negotiable. Strict adherence to this prevents a lot of unintended mishaps. You also must require all participants to know what channel they are using and how to change it. We don’t let anyone fly until they’ve demonstrated this. Yes, it’s that important to us—we’ve had too many video-related crashes to do otherwise. We’ve tried being lenient here, and it didn’t work. The system we use now divides the spectrum into “frequency groups”. When pilots register, they list what bands they have available. Our spreadsheet translates that into available groups, lettered A through G. Some pilots can only use the Fat Shark band which means they can use groups B through E. Others have the full range available. When we set up heats, we see what each pilot has available and assign them a group. Pilots who get assigned to the same group are told they are sharing and can’t fly together for that day. Group assignments are e-mailed out ahead of time. Pilots need to choose a channel they have access to within that group and arrive with their equipment already set up. We now do almost zero channel-changing on race day, and it’s proven to be effective for us. Hopefully as technology improves, this headache will go away. The industry is working on it. For now, it’s better to be vigilant and firmly require that your system is followed. This is the area that will catch your group out if you’re not careful, and it will ruin someone’s day when it does. The first thing you’ll need to do on race day is set up. Let pilots know when you plan to start setup and many will show up to help. You can incentivize this by opening the course for practice as soon as it’s set up. For your first event, allow at least 2 hours for setup. You’ll get much more efficient with it as you do more events, but you might still set aside 2 hours so that the setup crew can have lunch before the race event really begins. The next item is check-in. Publish a time when check-in begins and allow about an hour for it. Check-in usually begins informally as soon as setup is done, but it helps to publish a time. Your check-in routine can be pretty simple and only needs to cover a few important points. Make sure each participant signs any waiver or sign-in sheet required by the location. Do a video frequency check to make sure each pilot knows what they are assigned and who they are sharing with. If you’re going to be formally doing a spec check so you know each quad qualifies for its class, you’ll want to do that at check-in, too. Reiterate to each participant as they check in that nobody powers on if anyone is in the air. This rule still applies during practice time. Finally, if you’re using a timing system with transponders, issue the pilot their transponder and have them install it, and register their name and code with the timing system, and check that it’s functioning. Once a pilot has checked in, he or she is allowed to practice on the course. We haven’t found it necessary to formalize when and how pilots practice, but it could be helpful to say that pilots who have not yet flown the course get priority over repeated use. Encourage everyone to fly at least one battery worth so they understand the course line. Your day’s schedule should have a time on it for a pilot’s meeting next, when check-in closes. All racers must be present at the meeting. It’s mostly for reminders about what to expect and what’s expected of them, to update everyone with any new information or adjustments that have been made, and to allow some time to ask questions. Close the meeting by telling everyone the order of races and what heats each pilot is in. Allow a short pit time after the meeting before you begin racing. The course isn’t open for practice during this time, so any last-minute inspections or adjustments can be made. Announce who is racing first and who is on deck for the next heat. Pilots should be putting in fresh batteries, tightening props, checking equipment, and preparing to race. Starting races is much simpler when everyone understands the start sequence. Racers should have placed quads on the blocks and moved to the piloting area where there are a few chairs available. Many will be looking through goggles. Ask if everyone has clear video and can see their own video feed. (We put visible numbers on our start blocks to help with this.) Pilots can give a thumbs-up in response. If all pilots are thumbs-up at the same time, tell them to arm and start the countdown. Use an air horn to signal ‘go’ so there’s no confusion on when the race begins. There’s a tendency for many pilots to finish their laps and then use what’s left in the battery for some freestyle right in the middle of the course. This can be distracting, cause collisions, and generally cause a lot of delay over time, so it’s not permitted at our events. The expectation is that when you’re done with your race, you land. Nobody is allowed to walk onto the course when anyone is flying it, so as soon as the last pilot finishes everyone goes out together to retrieve their quads while the on-deck pilots set up. Anyone not on deck is encouraged to help find and retrieve frames and parts that have crashed and scattered. It’s natural to be a little lenient in getting everyone settled, allow someone to fix a “quick” mechanical problem, etc. Unfortunately, this is another area that can really cause the race day to drag out much longer than anyone wants. Our pilots have a limited time between when the last race ends and the next one begins. If you can’t get ready before your heat time, you’ll have to sit it out. Since we implemented this, it has really kept up the pace of the event and made it more exciting for everyone. A few pilots haven’t made it to their heats, but all our members have been very understanding and directly see the benefit. We also incentivize promptness by intentionally not assigning start block positions. If you’re ready first, you get your pick of the blocks. Last one in gets whatever is left. Efficiently handling this transition makes the whole day go much smoother—and if you do it well you’ll probably have some time left over afterward to invite anyone to do some freestyling. Your race is a great social event, and may be the only time many of your members get to spend with each other talking about all aspects of the hobby and watching friends fly. This is a wonderful aspect of the day, but it creates a lot of distractions from paying attention to the schedule and race times. One of our members takes on the task of making sure throughout the day that racers know when they’re supposed to be doing something or going somewhere. He’s likened this to herding cats. Your group probably needs a designated cat-herder, too. There’s a lot to do during the event: start races; make adjustments to schedule, heats, or frequencies; deal with equipment problems; watch the weather; make sure you’re on schedule; check that your timing system is working… the list of small items that can crop up during the event is endless and unpredictable. Your day will be most effective if you have a few different people who are working with you to organize that you can assign some of these tasks. Delegating lightens your load, which allows you to deal with the unpredictable things as they pop up. You’ll need that flexibility—especially if you also want to race and socialize yourself! 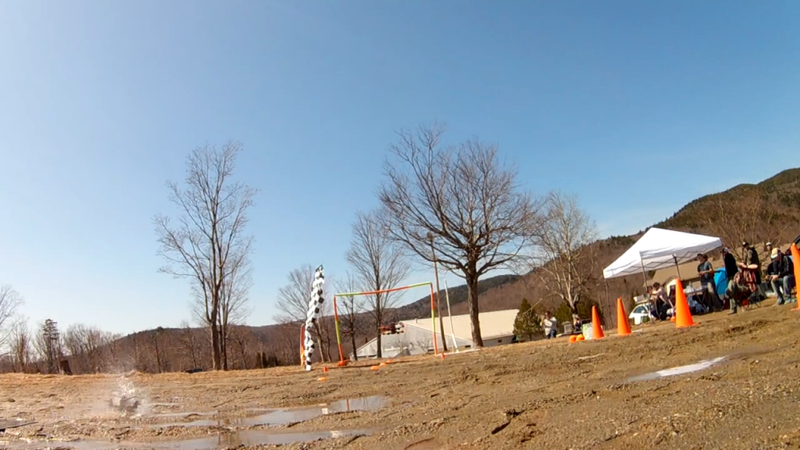 Our 2016 Mini-Maker Faire course for demonstration races and freestyle exposition was a big hit at the event. 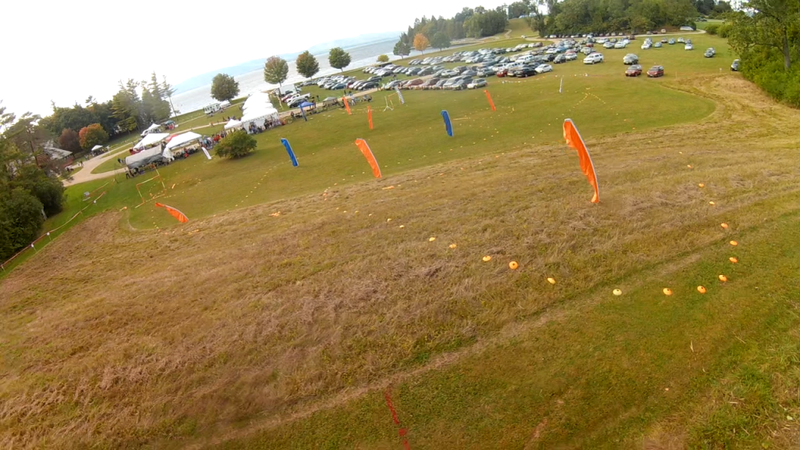 We controlled the speed nearest the spectator and parking area by using tighter, slower course features. Keep a first-aid kit and a fire extinguisher on hand. Watch the weather carefully so you can reschedule if you need to, or find shelter if there’s a storm approaching. Have participants help clean up the course while a few organizers sort out the final standings. Plan to gather for drinks afterward. Get a local hobby shop or drone store to sponsor some prizes if you can. Never forget that even though you are competing, this is your community first. Always be inclusive and solicit feedback. Let others help. Your group can be serious about racing without being overly competitive—find that balance. Attitude makes a big difference here and being too strict or too relaxed can eventually drive members away. Your community should always be open, sharing, and helping each other. You should be flexible and adapt as you go, but don’t let that stop you from doing research and planning ahead. The more you plan ahead of time, the less you have to think about when you’re on-site. That means more time for you to enjoy the company you’ve gathered and think about racing. Don’t forget to enjoy what you’ve created, and share your experience with other groups afterward. If you want to race and there’s nothing in your area, take the initiative! I started asking around and making plans before I even owned a race quad. It was tough going at first, but the more I put things together, the more interested people there seemed to be. We started with nothing but a few informal gatherings and eventually worked our way up to a full season of streamlined events complete with sponsored prizes. We’ve built an awesome community and have a blast about once a month all summer. It’s up to you to build the kind of event you want to have. Get out there and race!